Sunday 19th August. 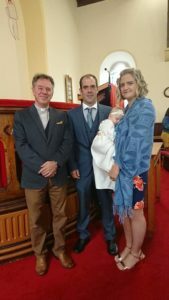 We welcome in baptism our newest member, Maisie Bridget Ferry, with her parents Michael and Amanda, big brother Ethan and sisters Bethany and Ruby. Lord, you have graciously saved and blessed us. With this ‘Jesus picture’ we call baptism. Cleanse and give new life to these dear ones. Include them in your covenant of love! And learn to trust and obey. And be a blessing to those they meet. They won’t remember this day. But we will, and you will. And help us follow through on the serious promise we’re making. Show us ways to make our home and church a place of love, and reverence, and joy! Make us the example of faith and obedience they need. Make the picture real for us all. Oh, and… thank you! For grace, and for everything.